eureka 3D puzzle - Math Dice Jr.
1. Roll the 12-sided Target Die and the five 6-sided Scoring Dice. 2. Combine the Scoring Numbers using addition and/or subtraction. 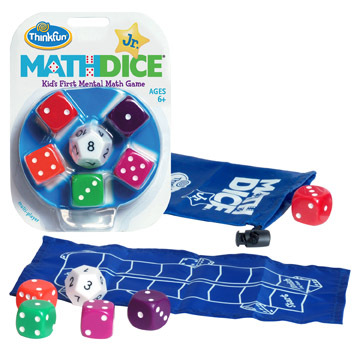 As your child builds math skills by playing MathDice Jr., he/she will begin to discover patterns and relationships that strengthen number sense understanding and overall math ability! MathDice Jr. is a great learning game for the classroom and for home schooling. Game rules in English, French and Dutch. # Players: Single & Multi-player game.